It is a flexible retro reflective material primarily used to increase the nighttime conspicuity of traffic signs, high-visibility clothing and other items so they are safely and effectively visible in the light of an approaching driver's head lamps. They are also used as a material to increase the scanning range of bar codes in factory settings. Enclosed lens reflective sheeting's. It is high quality and durable material designed for non critical traffic signage. Best For: Traffic signage at large angles. 3) PRISMATIC ENGINEERING GRADE REFLECTIVE SHEETING (PEG): A high quality durable prismatic sheeting for temporary and commercial signage. 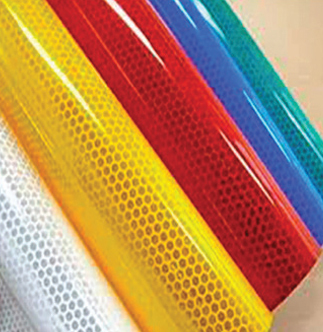 PEG sheeting offers exceptional value at low cost. It is extremely reflective at large angles for the approaching traffic. It offers brighter colour contrast, higher reflectivity and visibility ensuring great performance at night. It also has pressure sensitive adhesive. Best for: Temporary traffic signage. 100% Reflectivity with micro prismatic sheeting. It returns light to drivers of all vehicles, including heavy trucks and automobiles with the newest headlight designs and motorcycles. Best for: Highway and express way hoardings. These transparent films are designed for computer sign cutting and application on the surface of sheetings. MVP is a super high perferance, durable micro prismatic material. Its unique prismatic construction provides the highest level of reflectivity from long distances.